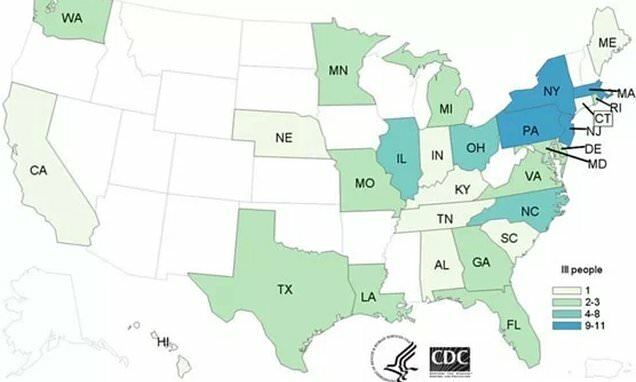 An outbreak of antibiotic-resistant salmonella linked to raw chicken has sickened 92 people across 29 states, a new report has revealed. According to the Centers for Disease Control and Prevention (CDC), 21 people have been hospitalized, but there have been no deaths. The strain - linked to raw chicken pet food, raw chicken products and live chickens - is resistant to at least 13 antibiotics used to treat the infection. Because of this, the CDC has not been able to identify a single, common supplier and the agency fears the strain may be widespread in the chicken industry. The first reported illness was on January 19 and the last on September 29, and people infected have ranged between less than a year old and 105. 'In interviews, ill people report eating different types and brands of chicken products purchased from many different locations,' the CDC said in a statement on Wednesday. On person became ill after pets in their home ate raw ground chicken pet food and another sick person lives with someone who works in a facility that raises or processes chickens.